To see the last edition of WCW EWR, click on this link. You maybe wondering why a TEXAS DEATH MATCH was put on the pre-show. Well, there’s actually a legitimate reason. La Parka and Kensuke Sasaki had been having poor ratings on the television shows. They were mostly in the 60% to 70% range and it was very disappointing. Kensuke Sasaki had been losing overness rapidly. Therefore, I demoted them to the pre-show because I didn’t think it’d get a good rating. 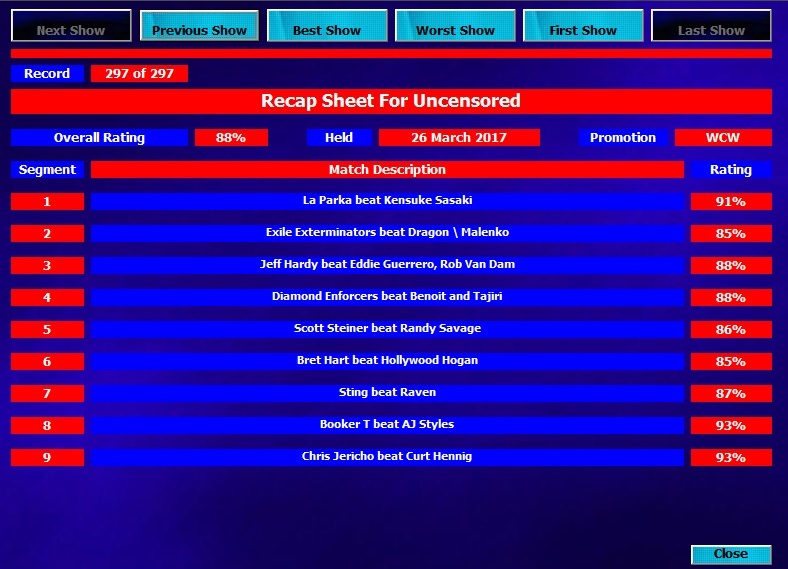 On the PPV in which I make that decision, Kensuke and La Parka pulled out a 91% RATING! 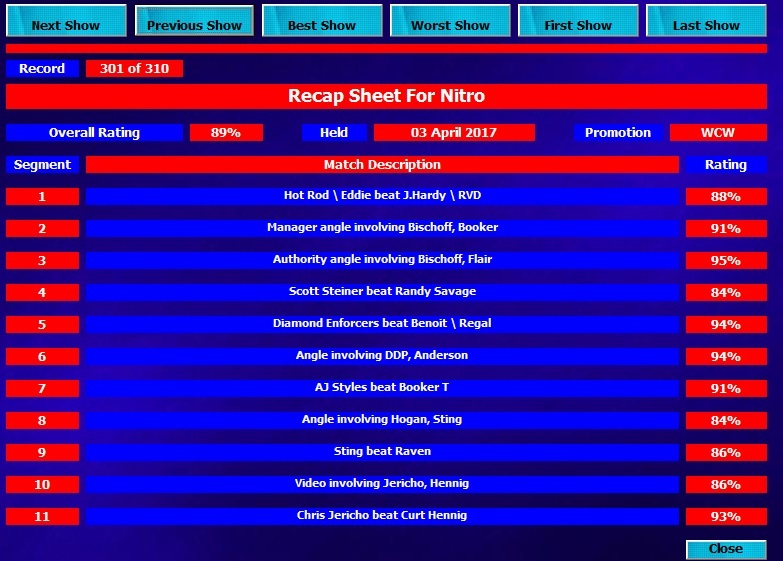 The match got a 100% overall which was a huge plus. These two had struggled with this feud but at least in their final match, they were able to put on a hell of a show. La Parka got really over from this feud and has got a really decent feud lined up next. Kensuke Sasaki regained a bit of his lost overness with this ending. However, I think this will end up being Sasaki’s last appearance on a WCW PPV. His contract is coming up and I think I’m going to let Sasaki go. Sasaki has delivered some amazing matches in this game but he’s not really over to level of the matches he’s had. Sasaki’s also being paid a lot, so it cuts a few costs for us too. We’re not losing money or anything, but there’s no point in keeping Sasaki at the moment. He might be resigned in the future but we’ll see. Shane Helms and Lodi were here to represent the Exiles. It’s usually Road Dogg and Perry Saturn, but these two have put on some great matches on TV. So I put them on the PPV together with the team name the “Exile Terminators”. Looking back, that name probably didn’t make any sense! They teamed up to take on the former WCW Tag Team Champions Dean Malenko and Ultimo Dragon. The heels won after miscommunication from Dragon and Dean. It got an 85% rating, which I was rather pleased with. Jeff and RVD were teaming up in a feud with Eddie and Piper, who don’t get along in the storyline. I was going to have Eddie vs Jeff in a rematch for the Cruiserweight Championship but then I noticed that RVD could also challenge for the belt. So it got turned into a triple threat. It got a 88% rating which I’m happy with. Eddie lost the match after botched interference from Piper. I’ll explain what happened here. I had a feud with the Diamond Enforcers going up against Benoit and Regal. However, Regal got suspended for talking negatively about the main wrestlers on the roster on an interview. So Benoit had to find another partner. The Asian Invasion group with Tajiri, Sasuke, Low Ki, Nagata etc was breaking up anyway. So I decided to have them hold a summit which saw the group go their separate ways. Benoit approached Tajiri about replacing Regal. Tajiri accepted this and the two had great chemistry in the ring, as one of the road agents noted. Tajiri’s been getting really over, which is why I gave him the opportunity. 88%. 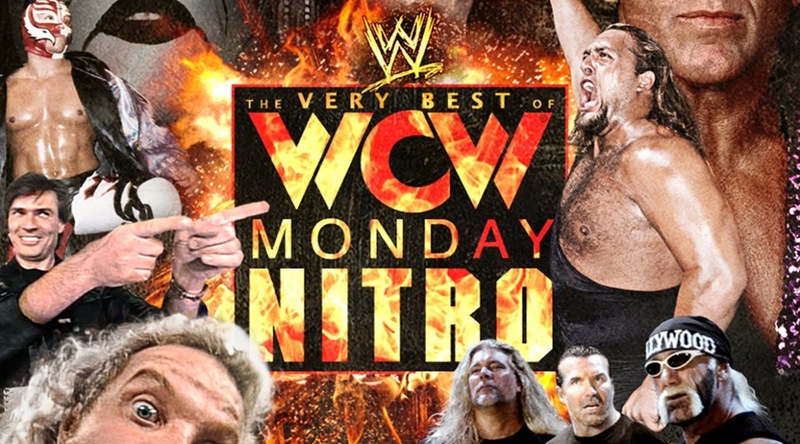 A great rating for a WCW Tag Title match. 86% was not a bad rating for this match either. Steiner went over after Jamie Noble ran in for the interference. Not a lot to say other than great ratings. I could have put anyone of these men over and it wouldn’t have really mattered. Bret and Hogan are both at 100% overness on this game at the moment. Either way, their both going to be two of the most over men in the company. Having said that, I don’t really put Hogan over that much nowadays. Maybe he should have gotten the win but again, it’s not going to hurt either of these men to do the job. 85% A decent rating considering Hogan’s match rating was bad as usual. The crowd was into it as the 100% crowd reaction demonstrated. DUSTY FINISH! Bret Hart ran into help Raven (the two of them had been partners in the past). Bret came out to hit Sting with his own baseball bat. Raven hit the Evenflow DDT, got the pin and was celebrating with the title. However, the referee noticed Bret with the baseball as he was hugging Raven. The ref sees the video replay which shows Bret’s involvement and the referee reverses the decision because of it. Raven responds by hitting Bret with the DDT in fustration. 87%. A damn good rating. The joint best match of the night along with the main event. These two matches both got 93%. Booker got the win after Eric Bischoff came down to hit AJ with the brass knuckles. I know it might seem strange to do the run in interference again after Raven got DQ’d for it. However, it’s not like a title was on the line in this match so we can kind of get away with it. 93% again. It was good to give Curt his first proper main event like this. He and Jericho excelled. This PPV was a really good PPV. Although there was nothing exceptional, there wasn’t anything that was bad either. The lowest rated segments were at 85%. That’s pretty incredible for me. 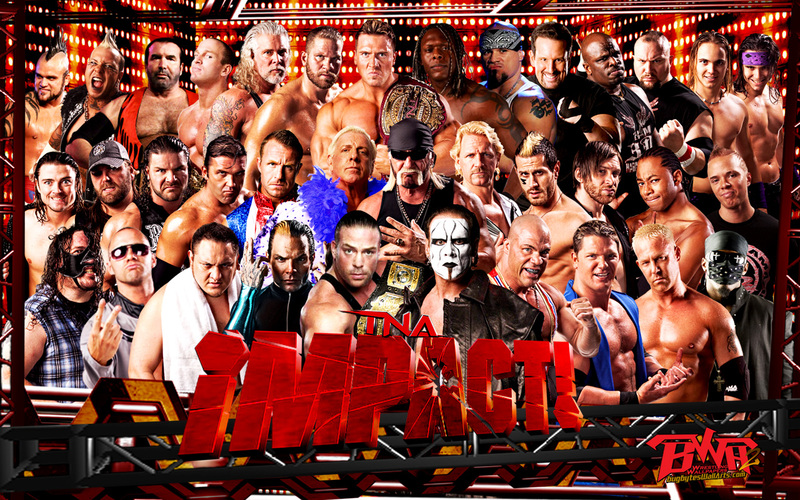 A great PPV.